Former Delhi Chief Minister and senior BJP leader Mr Madan Lal Khurana today announced that he would launch a movement against MCD’s demolition drive and sealing of shops. Criticising the government’s decision to hike the water tariff in the city by 10 percent, the BJP today accused the Chief Minister Ms Sheila Dikshit of trying to pave way for the privatisation of the Delhi Jal Board. The Delhi High Court has issued notices to the city Police Commissioner and SHO, Srinivaspuri on a petition filed by the mother of a young man who committed suicide due to alleged harassment by the ICICI Bank loan recovery officers. Justice R C Jain asked the two officials to file their replies and a status report on the incident and posted it for hearing to March 30. 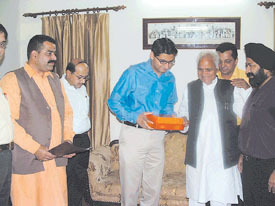 Mr Shiv Charan Lal Sharma, Sr. Deputy Mayor, Faridabad, greets Mr Deepender Hooda, MP, Rohtak on the occasion of Holi. The city, which is experiencing pleasant weather conditions, is likely to receive more rain in the next 24 hours. A cloud cover that enveloped the skyline, causing the rains over the last week, persisted today. Three labourers working at a brick kiln in Hateva village under Dankore police station fell out on a minor issue. The dispute became so serious that two of them attacked the third with a spade and killed him. Students taking their practical examinations bore the brunt of the standoff between teachers and the Principal at Delhi University’s Shivaji College here today. Three members of the Hardutt gang barged into a hospital here to try kill two men due to an old enmity, but shot at two women by mistake. The Kasna police have nabbed six junk dealers involved in robbing factories. Police have recovered goods and valuables worth lakhs. About half a dozen criminals barged into the house of the nephew of a councillor at 7 am on Holi day and decamped with valuables worth lakhs in posh Rajinder Nagar Colony of Modi Nagar. The consumers are cheated by the shopkeepers and traders due to lack of awareness. There is an urgent need to set up a platform where the consumer activists and government agencies could together provide the much-needed relief. Lauding the work of Anganwadi workers, Delhi Chief Minister Ms Sheila Dikshit today announced the opening of additional 526 such centres in the national Capital. “Today, when I see all these demolitions in Delhi, I want to do something for the people of the Capital. I am pained to see the lack of concern among those in Delhi BJP as well as those at the national level for the common people of Delhi and the small traders who are living under the constant fear of either being uprooted from their homes or having themselves divested of their sources of livelihood,” he said. 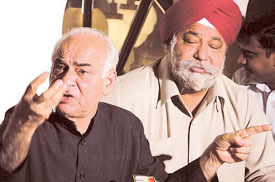 “So, I have now decided that the day the government action for sealing of commercial units begins, I, along with Mr Harsharan Singh Balli, will, if necessary, go and break the seals of the shops even if it means being arrested for defying the court orders,” Mr Khurana said at a press conference here. Mr Khurana said he had written a letter to BJP president Rajnath Singh, drawing the party’s attention towards the gravity of the problem confronting the people of Delhi and seeking its support for action against the demolition drive, sealing action and the eviction of hawkers. “If the party does not respond to our plea, then Balli and I, along with some of our friends in the party, will wage a lone struggle for the cause of the people of Delhi. We will not allow the sealing operation to go on at any cost. And for this I am ready to face any action,” Mr Khurana said. Mr Khurana regretted that the Delhi BJP did not lend support to his aide and MLA H S Balli’s hunger strike last month over the demolition of unauthorised constructions in Delhi following the orders of the Delhi High Court. “All through the hunger strike by Mr Balli, not one person from the Delhi BJP came to meet him to lend support to his struggle. Instead, he was warned of expulsion if he carried on with his hunger strike,” Mr Khurana said. Claiming that he left the post of Governor of Rajasthan to work for the cause of people in Delhi, he said, “Delhi is my temple and I cannot see its destruction before my eyes. I am ready to face any action for the cause of its people”. In this context, he pointed out that as early as December last year when the demolitions began, he received several calls urging him to do something to stop it. “At that time, it was Mr Balli alone who came forward to take up cudgels for the people of Delhi and told me he would go on hunger strike on February 7 in a bid to persuade the government to put a stop to demolitions,” Mr Khurana added. In this context, he said former BJP president L K Advani, instead of embarking on an All India Rath Yatra, should take out a similar yatra in Delhi to protest the current demolitions in the Capital. Terming his resignation as Delhi Chief Minister ten years ago on Mr Advani’s advice as the “biggest mistake of my life”, Mr Khurana said, “had I stayed on in the Chief Minister’s seat at that time, then all the problems confronting Delhi today, like the problem of unauthorised constructions, the commercial units and the shortage of drinking water, would have been solved a long time ago”. Speaking at the press meet, Mr Balli, endorsing the views of Mr Khurana, said, “If we were in power today, we would have solved the problem of unauthorised construction and that of commercial units in residential areas. Unlike the present government, we would have approached the court to seek relief for the commoners and small traders”. BJP Delhi Pradesh President Dr. Harsh Vardhan sought the constitution of a multi-member ‘Delhi Water Regulatory and Public Grievance Redressal Commission’ to check the “arbitrariness of the Chairperson of the Delhi Jal Board, Ms Dikshit, and the Delhi Jal Board itself for the continuously increasing water charges”. Dr Harsh Vardhan warned that if the proposed hike was implemented from April 1, his party will “initiate a strong movement to dislodge this anti-people Congress Government”. He said there is complete chaos in the DJB and that it has failed to achieve its objectives. “Ms. Sheila Dikshit is fully responsible for it. She is deliberately failing the Board so that water can be privatised,” he said. Calling for the reorganisation of the DJB, the BJP leader said that the Board should be accountable to the general public of Delhi. Blaming the DJB of failing to prevent the loss of water through damaged water pipes, he said because of leakage, more than 50 per cent of water was being wasted into dirty drains. “Instead of improving this condition, the Board wants to economically exploit the general public. The Chief Minister is herself the Chairperson of the Board. She has not punished any senior officer responsible for the leakage so far,” Dr Harsh Vardhan said. Referring to the need for constituting a ‘Delhi Water Regulatory and Public Grievance Redressal Commission’, he said that the body would control the activities of the DJB, fixing the water supply charges and hearing complaints and their redressal. The Commission, he proposed, should have representatives from the public and Residents’ Welfare Associations. The BJP leader pointed out that of the 850 MGD water that Delhi needs every day, the city gets only 670 MGD water from all the water treatment plants. “Summer has not yet started, but people are already craving for a bucket of water. If arrangements for additional water are not made immediately then the problem of law and order will arise,” he said. The Delhi High Court has issued notices to the city Police Commissioner and SHO, Srinivaspuri on a petition filed by the mother of a young man who committed suicide due to alleged harassment by the ICICI Bank loan recovery officers. Justice R C Jain asked the two officials to file their replies and a status report on the incident and posted it for hearing to March 30. The investigating officer was also asked to be personally present in the court on the next date. In a petition, Shanti Devi Sharma complained that her son Himanshu was forced to commit suicide on October 21, 2005 due to repeated harassment allegedly by hooligans hired by the bank to recover instalments of loans defaulted by the deceased. According to Surat Singh, counsel for the petitioner, Himanshu had obtained Rs 37,000 loan from the bank in June 2005 for purchase of a motorcycle for repayment in 36 instalments. However, due to financial difficulties, Himanshu could not repay two instalments following which it was submitted that the bank sent hired criminals who took away the motorcycle. The petition alleged that the ‘goondas’ abused both Himanshu and his wife in front of the entire colony before taking away the vehicle. It was claimed that though Himanshu offered to pay the arrears, the bank officials insisted that he pay an amount of Rs 44,000 for release of the vehicle. Feeling frustrated and insulted, he reportedly committed suicide. Shanti Devi complained that after initial reluctance, the Srinivaspuri police registered an FIR and case under Section 306 IPC against the bank officials for abetting the suicide. However, it was stated that police failed to take action against the guilty persons even four months after registration of the case despite it being a non-bailable offence. The counsel argued that while banks have the right to recover the loans, they cannot be allowed to hire ‘goondas’ to recover the arrears. Following the submissions and perusal of the preliminary records submitted in the court by the petitioner, the court issued the notices. While the minimum temperature today stood at 14.9 degree Celsius, the maximum temperature was 28 degree Celsius. The Capital has, since last Wednesday, witnessed three spells of rainfall. The coolness in the air is expected to continue for the next few days with the weather office having forecast partly cloudy sky and thundershowers in Delhi in the next 24 hours. The duo fled away from the scene of crime. The police have registered a murder case and sent the body for postmortem. The labourers were working on the brick kiln of Devinder Sharma in Hateva village where Laxman, Rajinder and Ashok were employed. According to SP (Rural), Sudhir Kumar Singh, they had a discussion regarding a piece of land. It soon turned into a heated argument and they came to blows. Laxman and Rajinder picked up spades lying nearby and attacked Ashok. Ashok’s neck was severed with the blows. Both the accused then escaped. Other workers informed the kiln owner. Police tried to nab Laxman and Rajinder and even raided their residences, but both are absconding. A murder case has been registered and the body sent for autopsy. The students taking the annual practical examinations had to do with ad-hoc staff playing the role of internal examiners as faculty members chose to boycott the examinations. “We had made our intentions clear and informed the university of our decision to boycott examinations. We have been forced to take this decision because our long standing demands have not been met,” said a member of the staff council, Mr Shiv Kumar Sahdev. While the faculty members along with some representatives from the DUTA staged a protest at the college, the university deputed the ad hoc staff to avoid any disruption in the examination schedule. “We had requested them to call off the boycott, but they went ahead with it. So we ensured that the examination was held,” said Dean of Colleges, Prof. Shirin Rathore. While the staff association claimed that they would call off the boycott if the university were to give them an assurance, Prof. Rathore said the administration has taken cognisance of their demand and would do the needful. “They want us to order an inquiry, which cannot be done in the absence of a Governing Body of the college. We have to go by the rules,” she said. According to Senior Superintendent of Police Hanif Qureshi, Deepak, son of Khazan Singh, resident of village Khandsa entered Pushpanjali Hospital along with two accomplices and fired three rounds to kill Surender and his brother Ranbir Singh of the same village in the afternoon today. The bullets, however, hit two women, Mayadevi and Manisha, who had come to the hospital to meet their relatives. They are out of danger, added the SSP. Mr Qureshi informed that Hardutt, serving a sentence in jail, had an old property dispute with Surender and Ranbir. Just last month, an attempt was made to kill Ranbir when he was shot at close range. He had come to hospital for dressing today. The officer said that the assailants had come in a grey Santro car with registration number HR 26 AB 7914. Pushpanjali Hospital is located just a stone’s throw away from the official residence of Gurgaon Deputy Commissioner. The public is surprised by the brazenness of the criminals. SP (Rural) Sudhir Kumar Singh said the gang had stolen power cables worth lakhs from NPCL powerhouse in Sector-32. A team was formed to track the culprits who had also stolen iron bars from Shri Ram Institute. The team under SO Shailender Kumar Sharma had arrested Shaukin, Narsena, Liaquat, Iqbal, Matloob, Sahir and Arif. They belonged to Dadri and Ghaziabad. The police recovered aluminium wire, iron rods (sariya), power cables and instruments for cutting scrap plastic. The SP said the criminals had confessed to having stolen power cables, aluminium wires from powerhouse in Sector-32 and iron roads from Shri Ram Institute. He said Shaukin had been committing thefts since he was 10. The SP said during the day, the miscreants scouted the area in the guise of junk dealers and identified houses and factories to be targeted. They would carry stolen goods to Delhi and Bulandshahr for selling them there. The family was made captive at gunpoint and locked into a room. The robbers took away Rs 25,000, jewellery and other valuables. Police have registered a case. Satish Nehra is nephew of Councillor Jagvir Singh who lives in Rajinder Nagar Colony on Saunda Road. He had just returned after taking his morning walk. Half a dozen robbers enquired from Satish’s mother Tushma Devi who was standing at the gate about Satish. As she came in, six criminals also entered the house and putting a gun at her temple told her to keep quiet. Subsequently, they tied hands and feet of Satish, his wife and father Jai Prakash and locked all of them in a closet. They snatched their cell phones and pulled out the wires of landlines. They took away the jewellery worn by the two ladies, Rs 25,000 and valuables kept in the house. This was the crux of a meeting organised at Palwal town yesterday on the occasion of the ‘World Consumer Rights Day’. The meeting was held by the Citizen Welfare Association, a leading social body in the district. Pointing out that exploitation of consumers was widespread, Mr Trilok Chand Gupta, president of the association, claimed that consumers were cheated in many ways: adulteration, impurity, high prices, fake and duplicate items and unsatisfactory after-sales service. He said despite the enactment of the Consumer Protection Act, the consumers were still supplied with substandard products and there was hardly any agency to carry out checking against the defaulters. He said though Consumers Forums had been set up to provide help to the victims, very few persons contact such bodies due to lack of awareness and guidance. Another speaker claimed that corruption and irregularities in departments deprive the poor of even the essential commodities available through the ration card. The meeting called upon the people to wake up and take action against the government departments, including the civic body for poor services. Ms Dikshit said her government planned to make another 1,500 Anganwadi centres functional during the next three to four years. “The Anganwadi workers have been functioning efficiently and providing motherly treatment to kids. They have strived hard to provide benefits of ICDS to the residents of the walled city, slum colonies and other under-developed colonies,” Dikshit said after inaugurating a workshop of Anganwadi workers here.